Let’s be honest, sometimes it’s intimidating to ask what something is when it seems like we should already know. Maybe you’ve heard of the theological term or Bible study method before, but that doesn’t mean you know what it actually is and it can be embarrassing to ask. Well, we’re here to help. 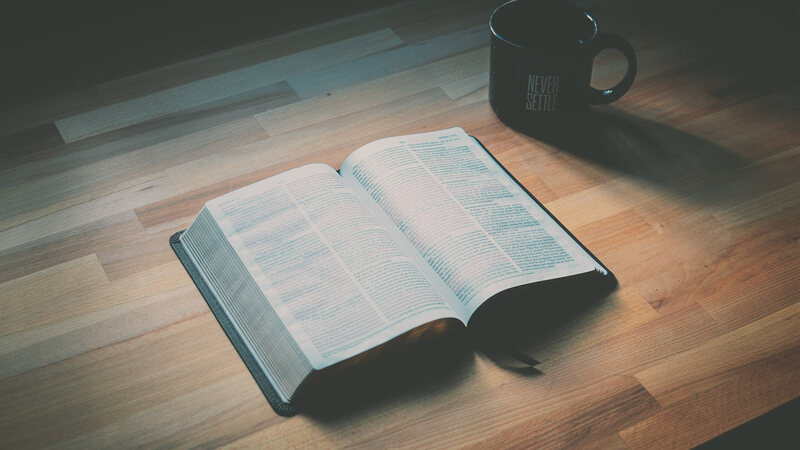 In this blog we’ll talk about the difference between a concordance and a cross reference and how they can help you in your own Bible study. A cross reference is a verse that has a similar theme or topic as the verse that you are reading. 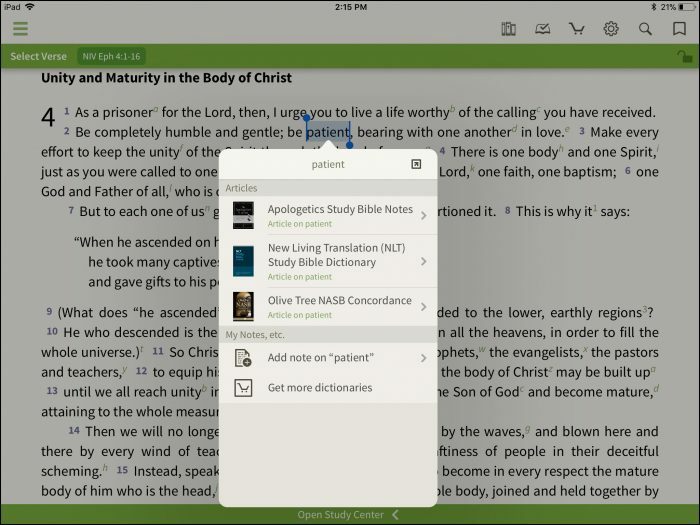 In the Olive Tree Bible App these are most easily found in the Resource Guide under Related Verses. In the above screenshot I’m reading Ephesians 4 in the NIV. Under related verses I see nine cross reference entries that are already a part of the NIV translation. I can tap the resource of my choice to bring up the specific cross references related to the text open in my main window. I chose the Treasury of Scripture Knowledge and now see a list of topics and words sorted by verse. The great thing about the Bible App is that I can tap any of these verses for a quick look without having to leave my primary reading. Cross references are a great tool when you are trying to study themes or topics found in all of scripture. But if you are wanting to do a specific word study then you’ll want to use a concordance. 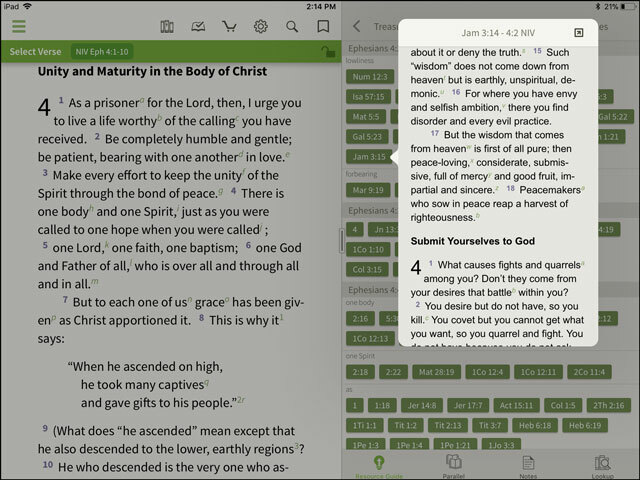 A concordance offers more precise lookups on specific words than a cross reference and shows you where those words appear throughout scripture. 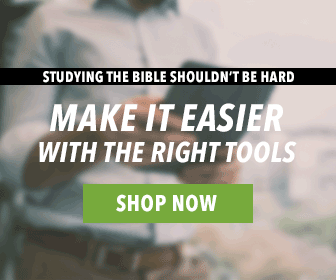 Like cross references, many Bible translations include a brief concordance section with the text but in order to do comprehensive word study a dedicated resource is the way to go. 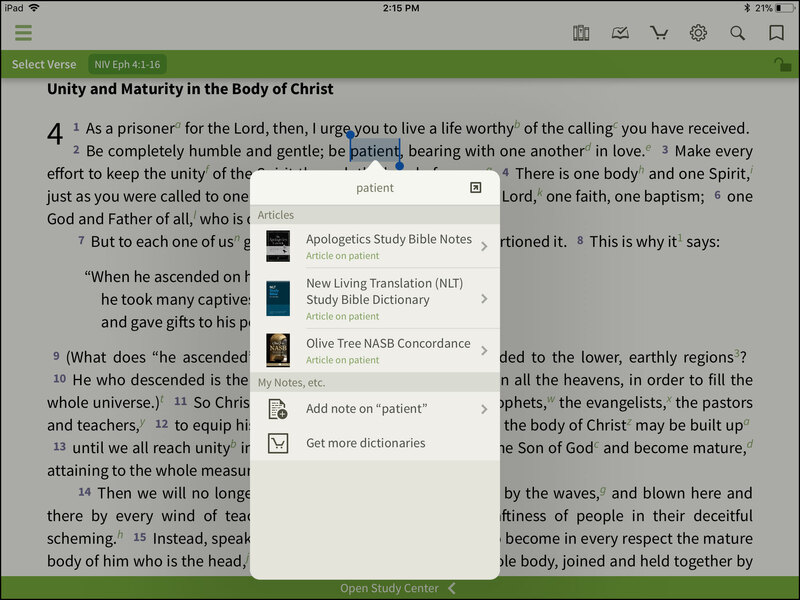 In the Bible App the easiest way to use a concordance is via the Lookup feature. In this screenshot I’ve tapped on the word patience in Ephesians 4:2. I then tap on Lookup. Then I’ll select the Olive Tree NIV Concordance. 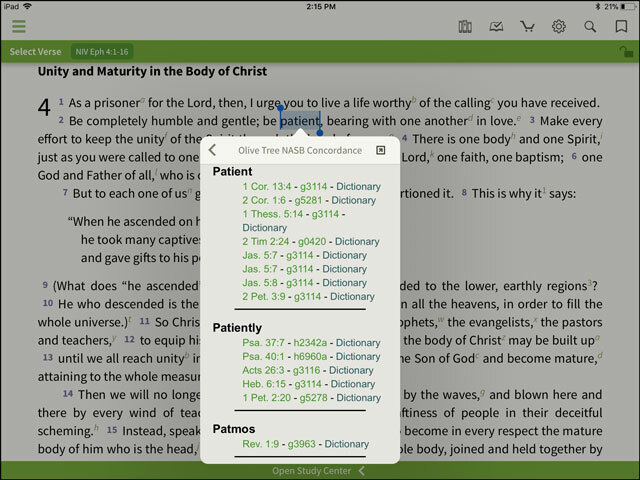 Now I get a list of where the word patient appears throughout the Bible and I can easily access those verses in the popup window for easy reading. You’ll notice that Olive Tree Concordance’s actually have three options. The verse references are a list of where the English word patient shows up throughout the Bible. The Strong’s numbers are where the Hebrew and Greek words that are translated as patient appear throughout the text. And the dictionary takes me to an explanation of the Hebrew or Greek word. 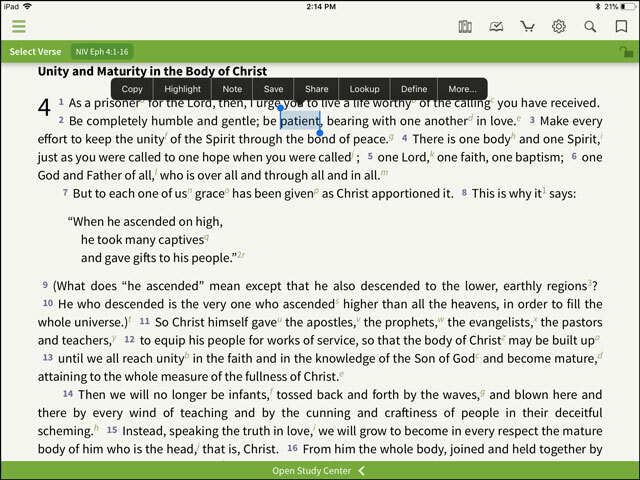 As you can see there are differences between a cross reference resource and a concordance. If you are looking for related themes and topics to the scripture passage you are reading, a cross reference is a great tool. If you want to do specific word study across Greek, Hebrew, and English then a concordance will be a tremendous help. 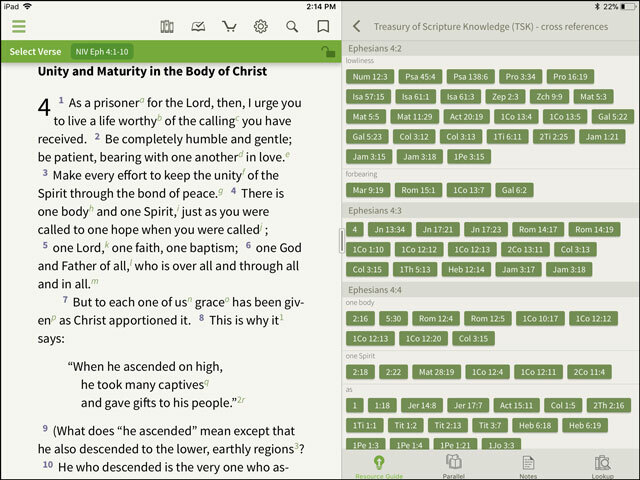 Go here to see what concordance and cross reference resources are available for the Olive Tree Bible App. How does a Commentary fit into the picture and what is it exactly? Commentary = Comment . It can be by an individual or group . It could be an explanation or application or . ….. a comment . A commentary is a person’s or a group of people’s explanation of Scripture, broken down either verse-by-verse or by a complete passage. 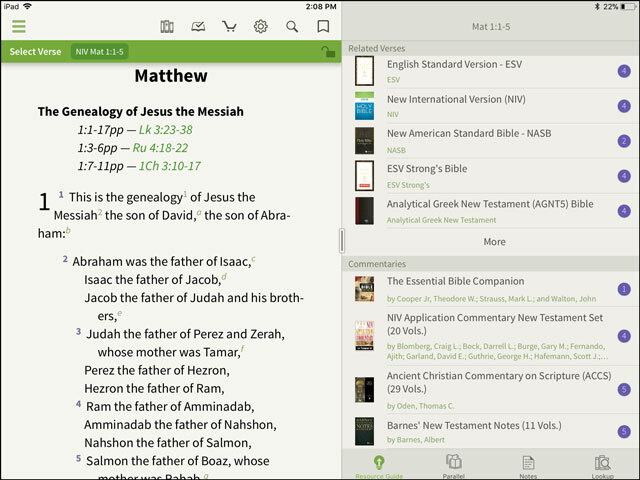 Some of the more comprehensive ones, like the Word Biblical Commentary (more than 60 volumes), examine almost every verse, focusing on the original languages and more “scholarly” topics like the passage’s literary form and historical context. Others, like “Feasting on the Word” and the “Lectionary Commentary,” focus on the assigned passages for Sunday worship for those churches who follow the Revised Common Lectionary. These would be more for sermon and lesson preparation. Still others are more devotional in nature (such as many study Bibles). It’s important to remember that every commentary will have some measure of theological/doctrinal bias. For example, a commentary written by a Lutheran will be based on Lutheran theology, while a commentary written by a Baptist will undoubtedly have Baptist doctrine as its starting point. The underlying purpose of commentaries is to help us understand Scripture better, whether as an academic, a church leader, or a Christian seeking spiritual growth from the Bible. Ask your pastor for advice on selecting a good commentary to fit your goals. A commentary is interpretation of biblical text for study or life application. It expands the biblical text, but is not the translation of the original manuscripts. Thank you for this tutorial. It is amazing how a supposedly “simple” piece such as this could be such a tremendous blessing. It has blessed me. 1) A cross reference is a link to a continuity or similarity of thought, maybe due to shared words, or maybe due to contextual similarity. So a passage on brotherly love might be linked to a passage on compassion, even if they didn’t share any exact key words. 2) A concordance will typically make a connection based on the existence of a shared term/word/concept that has an underlying literary sameness. It might be the word “Love” if in a simple English concordance, and map to a number of other uses of love that have underlying root differences (e.g. phileo vs eros vs agape), where a concordance based on the source word will potentially link more precisely (phileo to phileo.) Strong’s concordances create linkages based on a precise source word using a numbering scheme or “Strong’s number” for example. In this sense a concordance demonstrates less “commentary” than a cross reference might in my opinion. There still is some work to do however to make sure that the connection shares a message or correlates. The existence of the “same word” does not necessarily imply correlation between the passages. It may however enhance context due to similarity and expanding the example. 3. Commentary is an interpretive statement or explanation not contained in the original scripture that expands, explains, or tries to further develop context and understanding. These can be very useful but should be used with caution as they reflect bias and are not considered part of God’s inspired word which should stand alone. Nonetheless, commentary from a person with first-hand knowledge can be useful for examining a passage. A knowledgeable interpreter of middle-eastern languages may see the key point or emphasis in the middle of a passage where intended, where I may not understand that the key point isn’t the first line or some contrived summary at the end of the text for example due to my Western heritage. Use commentaries with caution, but using them has value. Just don’t make the commentary God’s Word, that is reflected in the source! Negative: Commentary can be used to connect things that really don’t relate in order to reinforce an author’s point of reference or bias, and thus misuse scripture. Positive: It can also point out something contextual like the season, or cultural norms of the audience, that helps when selecting between two possible interpretations of events. Understanding that removing a sandal in a certain context is similar to shaking hands or signing a contract is useful if you weren’t aware of that possible implication by the scriptural reference alone! Another way to see the difference that just struck me! A cross reference might link different tellings of the same event in different Gospels, because they are clearly the same event, while a concordance may not create a clear connection. This is hypothetical, but because of differences in the way the “feeding of the 5000” is told between the different Gospel writers, it is possible you might not connect the two narratives using a concordance only. And on the other hand, perhaps the English or German interpreters took some contextual liberty to reflect an underlying term in different English terms, like “love” and “charity”. If the underlying text identified the same Strong’s reference number, you might be able to correlate the passages with more assurance than our English/German/whatever version limited us to using a concordance. Thus both tools can provide valuable assistance in developing your understanding, but they serve slightly different purposes or angles. God bless! Thanks Jim for sharing. I have a better understanding of how I can use both of them. God bless. A concordance cannot distinguish between a term that is mentioned in passing at a few locations in the book and a term that is fundamental to the theme or focus of the book. The relative importance of words and concepts can only be determined by a subjective and intelligent analysis of the context of the discussion. No computer program can yet do this. An index and a concordance share very little. They are different creatures entirely, each serving a particular need. Concordances lack the analysis that goes into an index, and are consequently less useful. They can be, and are, useful as tools for the information professional; but I wouldn’t recommend them to the general publishing field.